DNP CX-330 Re-transfer Card Printer - ACE Peripherals ::: Completing I.T. Re-Transfer printing is the leading technology in plastic card printing and is able to produce true full bleed images, in high quality color, matching that of pre-printed card quality. Traditional "dye sublimation" card printing requires that the print head of the card printer print directly onto the card material through the printer ribbon. Print true edge to edge leaving a thin border around a card. Produce accurate color matching due to uncontrolled print surfaces. Print into depressions often found on smart cards and RF Proximity cards. Will not exposes the print head to the card risking print head damage on every print. The DNP CX-330 printing quality is excellent, full bleed printing, photo finish and irregular surfaces printing. Is the ideal solution for this kind of smart cards or RFID cards, thanks to the use of retransfer technology which prints over the protection film instead of directly over the card. The film protection minimizes card damages from the use. The DNP CX-330 card printer has 1 year of warranty. 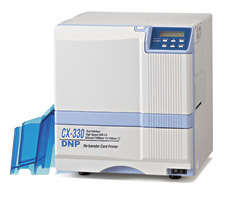 DNP CX-330 card printer is the most reliable, stable and solid printer of the market. Print head damage is less than with direct printing, so the print head doesn’t prints onto the card. Card flipping is made internally with no need of external modules. This, minimize technical and mechanical problems in the future. Besides, it offers the RFID cards and smart cards encoding option. The printer has a specific security function which consists in the protection of sent data for the card printing. Used ribbons are a perfect copy of printed data. CX-330 printer has an erase function of K panel, which consists in to erase all information remained from the card. Besides, includes IPSEC security protocol (Internet Protocol Security), a suite of protocols for IP communications which allows to manage the use of the printing by authenticating and/or encrypting each IP packet in a data stream. Also includes security protocols for the encoding. Includes UV printing option, visible only by applying an ultraviolet light. Photo finish printing; perfect Edge to edge; excellent even onto cards with difficult surfaces. Thanks to its film protection onto the cards, reduces external damages from the card using. Optionally with RFID and smart card encoder. The DNP CX330 Reverse Transfer Plastic Card Printers use two ribbon consumables. These are the retransfer film and color ribbon. The DNP CX330 Reverse Transfer Plastic Card Printer ribbon is available in YMCK (Yellow, Magenta, Cyan and Black Resin) and YMCKK format and is used to print all of the images on your card by mixing these colors in a Dye Sublimation process. The DNP CX330 printer then transfers the image to the retransfer film where it is able to accurately reproduce color and prints an image that has an "over the edge" bleed to ensure 100% card coverage. It is this process that also ensures that the print head does not come in contact with the card extending its life. The DNP CX330 printer then via a heated roller lays the retransfer film onto the card bonding the image to the card. Using the Card Five DCL Drivers included with the Card Five Card Printing Software, it is possible to print both sides of the card using the YMC panel for full vibrant color on the front and Black on the rear of the card. With an input hopper capable of storing 300 CR-80 Cards and ribbon/film capacity for 1000 prints, The DNP CX330 Reverse Transfer Plastic Card Printer provides the ability to print large volumes of cards virtually unattended.